Position the picker over the tick with the tick in the largest section of the picker, nearest the handle. Lift the handle so that the narrow nose of the picker is flat on the skin. 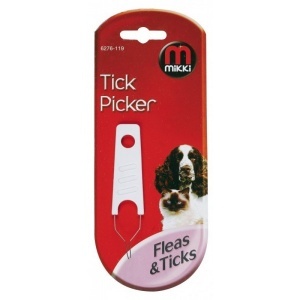 Draw the picker slowly and firmly towards the tick so that it is gripped securely and can be carefully lifted away from the smoothly in one action. Spray the area where the tick was attached with disinfectant. Ensure that there are no traces left on or in the skin.